If you’ve ever had a meeting with our Marketing Manager, then you will know his stance on whether blogging is paramount to the success of your marketing! He believes that without it you’ll have no new content going on your site (which helps with SEO), nothing to promote on social media and fewer pages to on your site to help generate sales leads. And, he’s not wrong. But, wait a second before you all rush off and start typing ferociously on your keyboards. 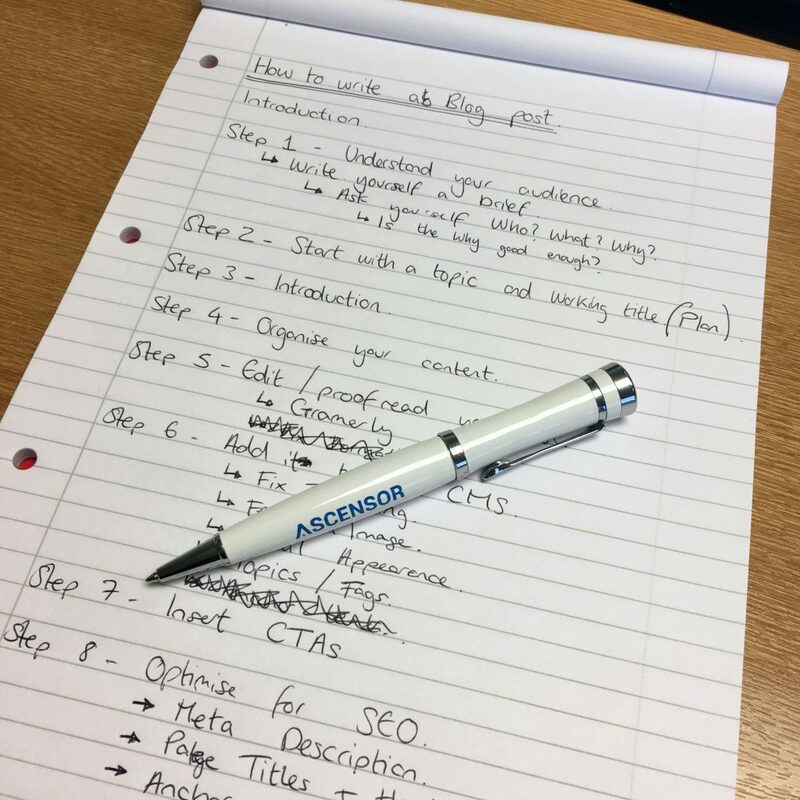 I think it is important to stress that although writing content will help with your Search Engine Optimisation, it is more important to write great content for your users. Google is focussed on creating a better experience for its users. Therefore, you should follow these steps to make sure you are not penalised by Google. Before you start to write, you need to have a clear understanding of who you’re writing for. This will help you with the Character or Persona that you should adopt, the tone of voice, the language you use and purpose of the blog. We believe to help you structure your blog more effectively you should plan it out before you start. This could simply be jotting down a working title and couple of bullet points of important things to include. This will help to keep your blog focused and easier to follow. If you want people to read your blog, then first, you need to grab their attention. You can do this in a whole manner of ways, our favourites: Tell a joke, a story or entice the reader with an interesting fact or statistic. Follow this up with describing the purpose of the post and how it will address the problem the user may be having. When you come to writing your content, think about how easy it is to digest. Think about the last time you were faced with an endless stream of text – I bet you thought “I’ll come back to that later” and never did! The trick is to organise your content into sections, lists, tips or like this post steps. At the end of every blog post, you want to add a CTA that indicates what you want the reader to do next. This could be; Subscribe to your blog, download an ebook, get in touch. Generally, it’s best to create a CTA that is beneficial for the reader rather than the marketer. Use your call-to-action to offer more content similar to the subject of the post they have just read. Once you have written your post and thought about your final CTA, it’s time to add it to your website. This gives you’re the opportunity to fix any formatting issues. First, you need to choose a visually appealing and relevant featured image. Then, you will need to make sure it is visually appealing using appropriate headers and subheaders. If your CMS allows, preview the post before setting live to make sure that elements are consistent throughout. There’s a reason why they call it Search Engine Optimisation, with Optimisation being the keyword. Therefore, we believe it’s best to go back after you have written a post and optimise it for search. Though don’t obsess over how many keywords to include. If there is an opportunity to add one, do it, but not at the sacrifice of user experience. Don’t over complicate your title and add keywords where they don’t belong, that said if there is a clear opportunity to add keywords you are targeting to titles/headers, go ahead. Although no longer a factor for Google’s Algorithms they are very important if you want to entice readers to read your post. Think about using verbs such as “Learn”, “Read” or “Discover” at the beginning of the description. These are words that link to another page either on your website or another website (if you are linking offsite, it’s worth setting these to ‘nofollow’ links – your web developer can help you with this). You need to carefully select which keywords you want to link to other pages on your site as Search Engines take this into account when ranking your pages for certain keywords. It’s also important to think about which pages you link to. Make sure you only link to pages that you want to rank well for that keyword. Step 8 – Share, Share, Share! It’s now time to set your post live and share it with the world! If you have mastered the steps above, then why not learn how to promote your business via social media.